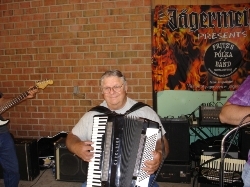 Fred is pictured here during FPB's gig at Ryder Park in DeWitt, NY on July 10, 2008. 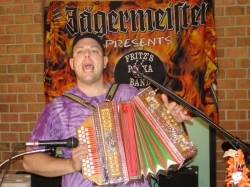 Fritz tears through a tune on the button-box accordion during FPB's second set on July 10, 2008 in DeWitt, NY. 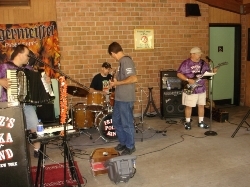 Fritz, Rick, Frank, and Gabe are shown here during FPB's second set on July 10th in Ryder Park. 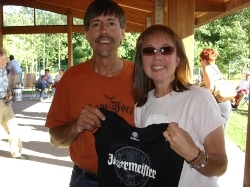 Frank presents Lori a Jager stretchy shirt, prior to FPB's first set on July 10, 2008 in DeWitt, NY. Lori booked FPB for the gig (Thanks, Lori!). 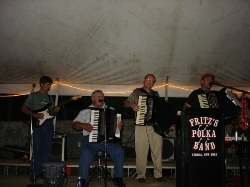 Frank, Fred, and Fritz are shown here during FPB's evening gig in Sharon Springs, NY on July 9th with their friend, Frank Svet, as Frank jammed on a few tunes with FPB in the second set. 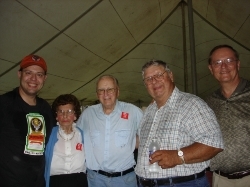 Fritz and Fred are shown here with their good friends, Isabelle, John, and Frank, during FPB's evening gig on July 9th in Sharon Springs, NY. Fritz is pictured here with his friends, Linda and Kim, after FPB's gig on July 9th in Saratoga Springs, NY wrapped up. 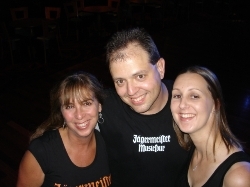 Rick is shown here with Linda and Kim on July 9, 2008 in Saratoga Springs, NY. 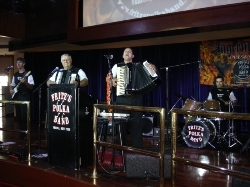 Frank, Fred, Fritz, and Rick are pictured here on July 9th during FPB's afternoon gig in Saratoga Springs, NY. 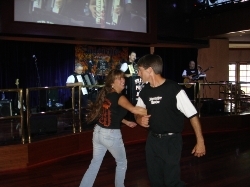 During FPB's second set during the afternoon of July 9th in Saratoga Springs, NY, Frank dances a tune with his friend, Linda. 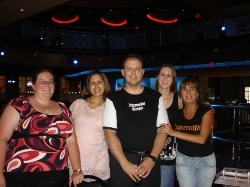 Fritz is pictured here on July 9th at Vapor at Saratoga Gaming & Raceway with friends he used to work with, Karleen, Camille, Kim, and Linda. 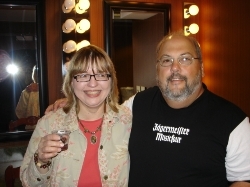 Gabe and his wife, Nancy (Fred's daughter/Fritz's sister) have a Jager toast during intermission of FPB's gig on July 9th in Saratoga Springs, NY. 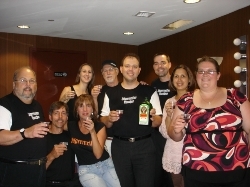 Members of FPB tip some Jager punch with Linda, Kim, Pa Bott, Camille, and Karleen, during intermission on July 9th in Saratoga Springs, NY. 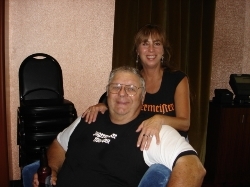 Fred is all smiles as he ges a picture with Linda, during FPB's intermission in Saratoga Springs, NY on July 9th. 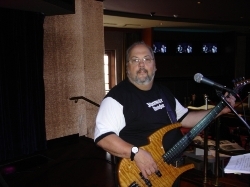 Gabe and his Parker bass during FPB's afternoon gig at Vapor at Saratoga Gaming & Raceway in Saratoga Springs, NY on July 9, 2008.